This Sunday we continue with the manifestation of another aspect of Jesus - that of the new Moses. 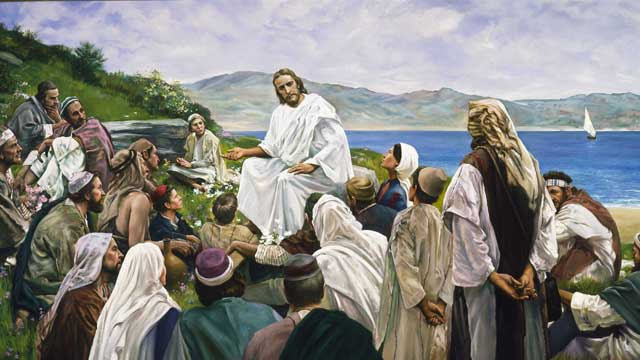 Just as Moses went to the mountain to proclaim the Law of God, Jesus proclaimed a new Law - a moral code that went beyond the ten commandments and would be a guide to a humble people. Our Gospel reading (Matthew 5:1-12) is taken from the beginning of Jesus' Sermon on the Mount, the Beatitudes.. This new moral code was more about who we are and what we should do rather than what we shall not do. Blessed are you when they insult you and persecute you and utter every kind of evil against you falsely because of me. Rejoice and be glad, for your reward will be great in heaven." In our first reading (Zephaniah 2:3' 3:12-13) the prophet addressed those who have remained faithful to God through their humility and observance of the law. Their recompense would be shelter in the Lord on the day of judgement. Seek the LORD, all you humble of the earth, who have observed his law; seek justice, seek humility; perhaps you may be sheltered on the day of the LORD's anger. But I will leave as a remnant in your midst a people humble and lowly, who shall take refuge in the name of the LORD: the remnant of Israel. They shall do no wrong and speak no lies; nor shall there be found in their mouths a deceitful tongue; they shall pasture and couch their flocks with none to disturb them. In our Epistle reading (1 Corinthians 1:26-31) St. Paul explained how God turned the world on its head, extolling the weak and humble over the strong and proud. Our blessing is found in our suffering; our redemption is through no doing of our own, but purely through the mercy of God. Consider your own calling, brothers and sisters. Not many of you were wise by human standards, not many were powerful, not many were of noble birth. Rather, God chose the foolish of the world to shame the wise, and God chose the weak of the world to shame the strong, and God chose the lowly and despised of the world, those who count for nothing, to reduce to nothing those who are something, so that no human being might boast before God. It is due to him that you are in Christ Jesus, who became for us wisdom from God, as well as righteousness, sanctification, and redemption, so that, as it is written, "Whoever boasts, should boast in the Lord." We must be poor in spirit to allow God's Spirit to bear fruit in us; we must embrace our weakness to allow God's strength to work through us; we must rejoice in our suffering and persecution (as did Christ himself) in order to see our reward in heaven.